Today, Estonian broadcaster ERR announced the Eesti Laul semi finalists. Due to the record number of entries, ERR had to work hard to select the top acts. But who are the acts that got selected for the Eesti Laul semi final stage? 1. All I Need – Daniel Levi. Music: Ago Teppand, Daniel Levi Viinalass. Lyrics: Ago Teppand, Daniel Levi Viinalass. 2. Electric – Almost Natural. Music: Amiran Gorgazjan, Anis Arumets, Noah McNamara, Willie Weeks. Lyrics: Amiran Gorgazjan, Anis Arumets, Noah McNamara, Willie Weeks. 3. Everything But You – Carl-Philip Madis. Music: Carl-Philip Madis, Carola Madis, Arno Krabman, Jaap Reesema. Lyrics: Leon Paul Palmen, Noah Mcnamara, Carola Madis, Carl-Philip Madis. 4. Feel Me Now – Ariadne. Music: Tomi Rahula, Margus Piik. Lyrics: Anni Rahula. 5. Have You Now – Karl-Kristjan & Whogaux feat. Maian. Music: Karl-Kristjan Kingi, Hugo Martin Maasikas. Lyrics: Hugo Martin Maasikas, Karl-Kristjan Kingi, Maian Lomp. 6. Hey Kiddo – Laura Prits. Music: Tara Nabi, Laura Prits, Andres Kõpper. Lyrics: Tara Nabi, Laura Prits. 7. Hurricane – Leemet Onno. Music: Leemet Onno, Ed Struijlaart. Lyrics: Leemet Onno, Ed Struijlaart. 8. In Or Out – Elina Born. Music: Stig Rästa, Vallo Kikas. Lyrics: Fred Krieger, Stig Rästa. 9. Keep Running – Liis Lemsalu. Music: Liis Lemsalu, Mihkel Mattisen, Gustaf Svenungsson, Magnus Wallin. Lyrics: Liis Lemsalu. 10. Make Love, Not War – Alvistar Funk Association. Music: Inga Kaare, Margus Alviste, Jürgen Urbanik. Lyrics: Inga Kaare, Margus Alviste. 11. Slingshot – Lenna Kuurmaa. Music: Lenna Kuurmaa, Nicolas Rebschher, Michelle Leonard. Lyrics: Lenna Kuurmaa, Michelle Leonard. 12. Sounds Like Home – Close To Infinity featuring Ian Karell. Music: Ian Robert Karell, Johannes Kanter, Sander Ulp, Tanel Kordemets. Lyrics: Ian Robert Karell. 13. Spirit Animal – Kerli. Music: Brian Ziff, Kerli Kõiv. Lyrics: Kerli Kõiv. 14. Supernatural – Uku Suviste. Music: Oliver Mazurtak, Uku Suviste. Lyrics: Oliver Mazurtak, Uku Suviste. 15. Suur loterii – Ivo Linna. Music: Rainer Michelson. Lyrics: Urmas Jaarman. 16. This Love – Rasmus Rändvee. Music: Bert Prinkenfeld, Stewart James Brock, Ewert Sundja, Rasmus Rändvee. Lyrics: Stewart James Brock, Ewert Sundja, Rasmus Rändvee. 17. Valan Pisaraid – Janno Reim, Kosmos. Music: Janno Reim. Lyrics: Janno Reim. 18. We Ride With Our Flow – Angeelia. Music: Angeelia Maasik, Andres Kõpper. Lyrics: Angeelia Maasik, Andres Kõpper. 19. Verona – Koit Toome ja Laura. Music: Sven Lõhmus. Lyrics: Sven Lõhmus. 20. Vihm – Antsud. Music: Aile Alveus-Krautmann. Lyrics: Aile Alveus-Krautmann. There are many familiar faces in Eest Laul 2017. The well known ex eurovision participants returning to Eesti Laul include Elina Born and Stig Rästa. 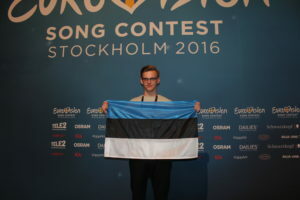 Elina and Stig sang Goodbye To Yesterday for Estonia in Vienna, ended up placing sixth and are now back with the intention of flying the Estonian flag in Kyiv. Also returning is Laura. She entered Eesti Laul in 2016 and she was also part of the group Suntribe in 2005. They failed to qualify for the final. Laura’s song will be composed by Sven Lõhmus, who has composed three of Estonia’s previous entries (2005, 2009, 2011). Another famous face from 10 years ago is Ivo Linna, who represented Estonia in 1996. Lenna Kuurma, who is a former member of Vanilla Ninja returns, having gained 5th place in the 2008 contest. Finally, Koit Toone is back, he previously represented Estonia in 1998 and gained 12th place.